Love is in the air, and probably in your children’s classrooms! 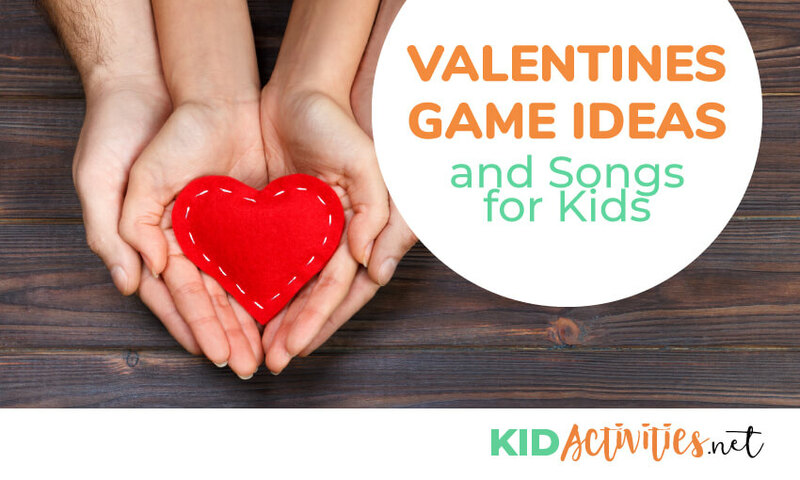 Get ready for February 14 with this selection of fun children’s Valentine’s Day games and songs for kids. 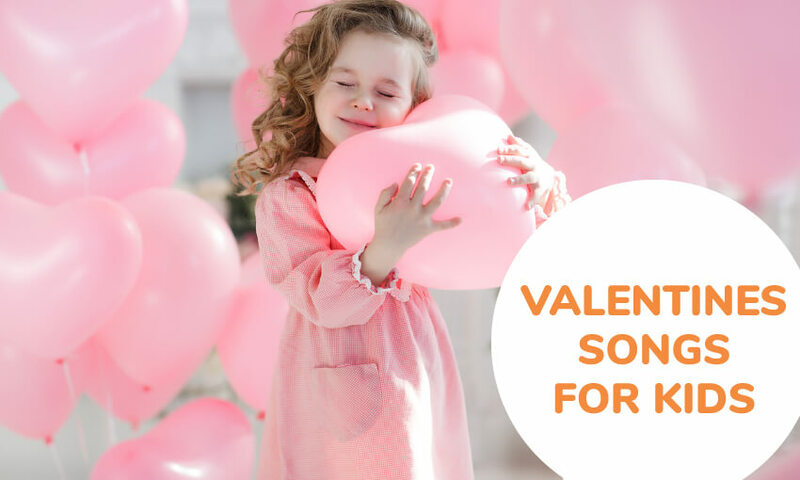 If your kids have worked up an appetite, make sure to check out this selection of Valentine’s Day Snacks and Food to be enjoyed after these games and songs! Celebrate a healthy heart with fun, aerobic activities that get children up and moving. You can set up several skill stations; this is an idea adapted from Celebration Games: Physical Activities for Every Month. Set up four or five step aerobic steppers and music. Demonstrate several aerobic exercises and have children perform three aerobic exercises of their choice at this station (ie. jumping jacks, jumping rope, jogging in place). See more heart-healthy exercise ideas. Pictures of both high and low cholesterol foods are taped down. Children throw beanbags underhand from a throw line at low cholesterol foods. Place them in a numerical order and have them keep this order for all stations. Set the number of tries for each turn and announce when it is time to rotate to the next station. Leave ample space between stations and advise children not to stand in the throwing areas. ♥ Play regular Limbo, but when children go out,they must say something nice about child in front (or back) of them. A great Valentine’s Day game idea for encouraging kindness! ♥ Use tape or chalk to mark starting and turn-around points on the floor. Match children with partners (You could use the broken heart game in the above idea) and then divide the group into teams. If teams are uneven, have one pair go twice. ♥ Each pair holds a towel between them with an inflated balloon resting on top of the towel. At the signal, have each pair race from the starting point to the turn-around line and back–while balancing the balloon on the towel. ♥ If the balloon falls off–the pair must stop and replace it. Each pair then hands the towel with the balloon to the next pair in line—until all have had a turn! ♥ They then roll the ball to someone else in the circle and it becomes that person’s turn to say something they love. ♥ The next person might say “I love bears” and then roll the ball on to someone else. ♥ Just as with all good game playing. Continue and END BEFORE the children grow tired of it. ♥ NOTE: This is a good way to get kids to think about the things they appreciate and learn about each other. ♥ Divide the group into teams of four or five children. ♥ Distribute construction paper and tape to each team. ♥ Explain to the teams that they will have ten minutes to build the tallest tower they can without talking. They can use only the given supplies. ♥ At the end of ten minutes, have each team display their tower and discuss whether it was easy or difficult to build and why. One player is the leader or St. Valentine, and orders the other players to make motions by saying “St. Valentine says,” and then an action. They might say “St. Valentine says thumbs up”, “St. Valentine says hands on your head” or “St. Valentine says jump up and down.” The leader also makes all of these motions. If he omits the “St. Valentine says” part, and just orders “Thumbs up” or “Jump up and down”, the players must not make the motion. Anyone who does so is out of the game. The winner is the player who remains in the game the longest. ♥ Divide the youth into two groups (if not even, have one child go twice). Give each team a small stuffed Valentine heart. Have one child from each team place the heart between their legs and hop to the end of the room and back. They give the heart to next child in line, and this repeats until children have had their turn. The first team done is the winner. Use the cardboard heart pattern template to trace two hearts onto the felt. Cut out hearts and place one on top of the other. Put a safety pin through the middle of the hearts to hold them in place while gluing. Glue the two pieces of felt together along the edge leaving a 3″ opening. Use fabric paint to add a child’s name to the top of each pillow; let dry. Stuff the heart with fiberfill and glue the pillow shut. ♥ Take a cardboard box and cut out 5-6 Valentine hearts. Make them big enough for young children to throw bean bags through. ♥ Decorate the box in a Valentines Day pattern and colors. ♥ Have the children take turns throwing bean bags in into the holes. ♥ If budget allows, have a prize for the child who gets the most in with three throws, and small prizes for ALL players. ♥ If you don’t have a box you can always draw hearts on a ground or wall with red or pink chalk and try to toss your bean bags. into them instead. 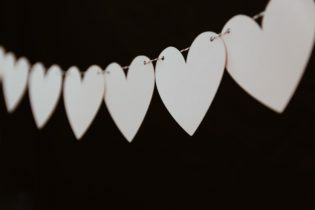 ♥ Create some name tags with words that relate with Valentine’s Day, such as: hearts, flowers, red, white, pink, and love. ♥ You’ll then tape this tags on people’s backs-but they can not look for the names. They must not find out what word is on their tag until the game starts. ♥ Everyone goes around and gives each other clues about the “valentine word” on their backs. You can ask a person only one question at a time. The game continues until everyone has found what theirs tag says. ♥ All players inflate their balloon. Some players may need help. ♥ Score 5 points for the closest balloon and 15 points for a direct hit. ♥ This game works well with teams – each team gets their own colored balloons; red, blue, green etc. Or, you do not need to keep score at all and just have fun playing the game several times. Before play—cut a medium paper heart. Provide each player with 4 plastic disks (Tiddly Winks or Bingo markers). ♥ Form a circle at a table or on the floor. Place the heart in the center of the circle. When you say “Go” the players “shoot” their disks onto the heart by pressing the edges with another disk. ♥ How many can they get to land on the heart? 1. Players sit in a circle, making sure they can see everyone else. One player who is “It” starts the game by smiling widely, while all the other players are somber. “It” then uses their hand to wipe the smile off their face and throw it to another player, who has to catch the smile with their hand, and then put it on. 2. The new “It” can wipe off the smile to throw to someone else (though he/she will probably choose to make funny smile faces at everyone for a minute or two before relinquishing the happy role.) Meanwhile, all other players must sit stone-faced. One smirk and they’re out. ♥ Staple a 2″ piece of string to a heart cut out of posterboard or construction paper. Hide the heart while all players close their eyes. The Valentine maybe covered but the string must be left exposed and visible. Skip, crawl, crab walk, hop, walk backwards, etc. ♥ Divide the children into groups (if not even, have one child go twice) Put the hearts at the end of the room in a pile for each team. ♥ Return the hearts to the bottom of the pile until ALL have had a turn. Tip: Laminate the hearts for future Valentine Day games. This game can also be adapted to other themes such as St. Patrick’s Day with shamrocks instead of hearts. ♥ Set a kitchen timer for one minute. When the time starts, write down as many Valentine AND friendship related words that you can think of. Example: heart, cupid, love, gifts, candy, sweets, sweet, cards, flowers, jewelry, dinner out, kiss, hug, like, roses, arrow, ribbons, paper doilies, present, friends,etc. This is a version of the ‘Halloween Mummy Wrap’ game! For Valentine’s Day, instruct the children that they are wrapping a Valentine gift. When they are done wrapping their “gifts,” give them a big red bow to finish the package. Play this game in pairs or small groups. ♥ Before you play, make half as many 24″ hearts as there are children in the group. ♥ Tape the hearts to the floor in a large circle. ♥ Play music and have the children walk around the circle of hearts. Stop the music intermittently. ♥ When the music stops, have each child stand on a heart with both feet. More than one child can share a heart. Children may hang on to one another in order to stay on their heart. ♥ Do not eliminate palyers – instead, eliminate hearts. ♥ Have one child sit in the middle of the circle while covering their eyes. ♥ Give another child a Valentine to hide behind their back. ♥ Have all other children put their hands behind their back. ♥ The child in the middle gets three guesses. The one who hid the Valentine is the next to go into the middle. ♥ Prepare a large heart from construction paper before the party. 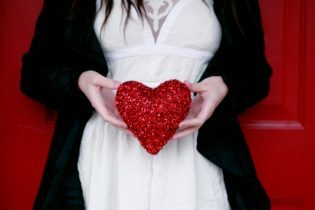 ♥ Put children in a circle, and play silly Valentine music while they pass around the paper heart. ♥ The person holding the heart when the music stops wins a treat. ♥ Bring plenty of treats to make sure each child receives one. Divide youth into two groups. Have one child from each team draw a Valentine object on the blackboard while the rest of the team tries to guess what is being drawn. This is not a game, but a great group activity to see who can give the biggest smile!. One at a time measure people’s smiles with a ruler or measuring tape. This is fun. You can also measure the zany faces! Take photos as you do this as people are smiling BIG! ♥ Have each participant hold a piece of valentine colored construction paper in their hands–behind their back. ♥ Create a Miss Valentine with large, heavy poster board or cardboard. Be creative and use moving eyes, false eyelashes and pipe cleaners for hair (everything but the lips). ♥ Write a “number” on each pair of red lips cut out of construction paper; Place tape on the back of them. ♥ Put a blind fold on the children and have them put the lips on the Ms. Valentine. A good ‘lead in’ game to find partners or just have fun! ♥ In advance cut each heart into two pieces with BOLD, UNUSUAL LINES- SO EACH ONE IS UNIQUE! ♥ Distribute one-half of a heart to each child. ♥ At a signal have the children find the other half of their hearts. ♥ A good idea would be to combine all collected candy kisses– and divide them evenly between the children. 1. Before play: Cut a LARGE heart “target” out of paper or fabric. 2. Use a marker to make a large X in the center. 3. Make or purchase three bean bags. 4. To play – place the heart on the floor and a strip of tape an appropriate distance away. Six feet for young children, farther for older children. 5. The players form a line and take turns standing with their toes on the tape. 6. Toss the Bean Bags one at a time attempting to hit the X. Place a piece of chocolate candy in your mouth– and see how long it takes to melt! No sucking and chewing it! The one to keep the chocolate IN THEIR MOUTH THE LONGEST is the winner! 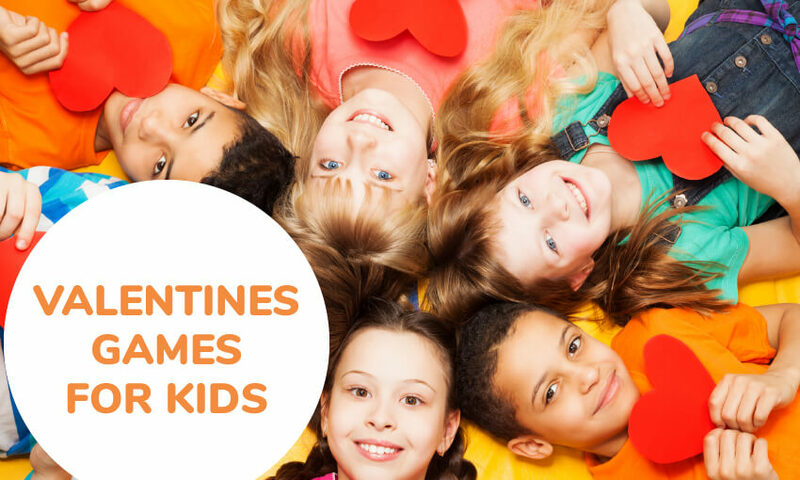 Keep the laughs going with these Valentine’s Day jokes you can tell to your kids! 29. Won’t You Be a Friend to Me? Won’t you be a friend to me? Friend to me? Friend to me? Won’t you be a friend to me? And I’ll be your friend, too! ♥ Teach children the song: Won’t you be a Friend to Me? ♥ When children all have a colored object, they walk about the room singing the song. When the song is complete, they partner with a ‘friend’ who holds the same color that they are holding. ♥ When matched with a friend, they both sit down as quickly as possible. When all are sitting, children change colors with each other and a new round begins! It’s for a special friend. Did you guess? It’s you! 32. Do you know my Valentine? There’s plenty for a family. Demonstrate putting the ‘heels’ of hand palms together. Curve all the fingers so tips are down-ward and meeting to make a heart. When all children have learned the movement-say it with the following poem. I sent 1 to mother, now there are 4. I gave one to my brother now there are 3. I gave one to my sister now there are 2. I gave one to Daddy, now there is 1. I gave it to mother, now there are none.